12 French Closed Catheter System Kit. Includes: Latex-Free Catheter, Nonstaining Bzk Wipe, Three Povidone-Iodine Swabsticks, One Pair Gloves, Sterile Wipe, And An Underpad. 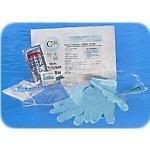 14 French Closed System Catheter System Kit. Includes: Latex-Free Catheter, Non-Staining Bzk Wipe, Three Povidone-Iodine Swabsticks, One Pair Of Gloves, Sterile Wipe, And An Underpad.